Twitter has launched its new tool that allows you to easily embed tweets into a website or blog post. The tool, called Blackbird Pie, is a website that simply asks you for the URL of a tweet. Once you copy that in and hit “Bake it,” you get back a preview of how it will look on the web, and a box with the code you need in it. A few nice things about the tool: 1) it picks up the styling of your own site. 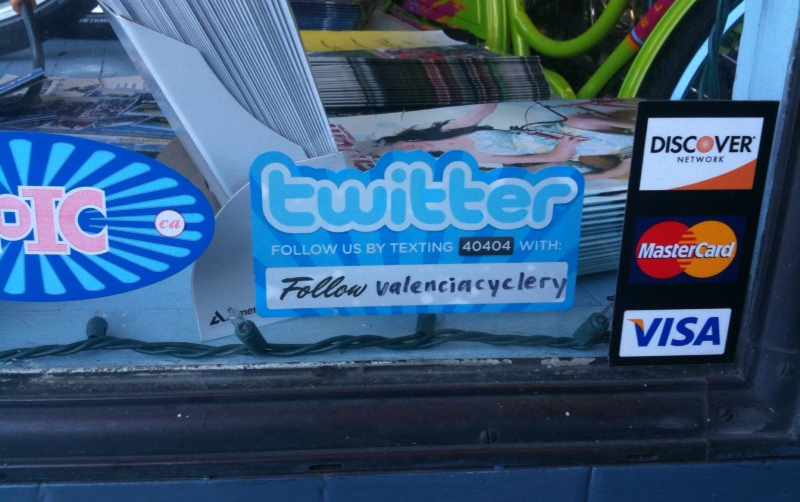 “Note that when you paste it into your site, the tweet will pick up some of your styling, e.g. the font-family you use on your tags. That’s intentional!,” Twitter writes (noting that it may change this). 2) It also copies over whatever background a person uses on Twitter. So in that regard, it is just like taking a screen grab. 3) The embeddable tweets actually look nicer than the one Twitter previewed yesterday on its media site. While the embed code is a mess of inline elements right now, they promise shorter code is coming. They’re also asking that bug reports be tweeted at @twittermedia. Now its time to say bye to Bit.ly on Twitter. It is not clear how the new feature will affect bit.ly, the third-party link shortener Twitter currently uses as its default, but it sounds like that may change soon. Clues to just such a change have appeared recently. Twitter investor Fred Wilson singled out link shorteners in a post urging Twitter developers to stop filling holes in Twitter’s product. Twitter already owns its own short URL, twt.tl, which it uses as an anti-spam mechanism in direct messages. 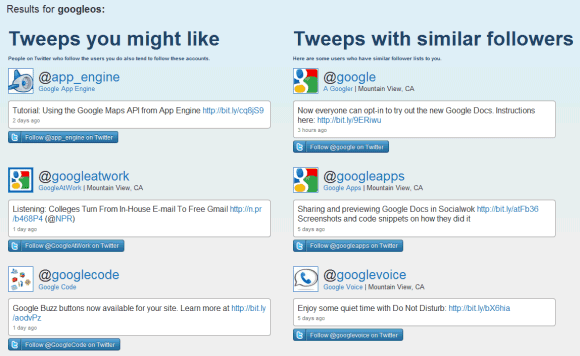 But it also owns Twee.tt, which is more in keeping with its brand since it already uses Tweet throughout its product. Williams did not address bit.ly’s status specifically, so maybe it will continue to have a role. It certainly grew on the back of Twitter. But even if it is no longer used on Twitter.com, Twitter clients may still continue to use bit.ly. If it proves to be a more useful shortener, especially to brands such as Amazon, the New York Times, and others via bit.ly Pro, it may have enough momentum to survive being delisted, as it were, from Twitter. The lists in Google Follow Finder are generated using public following and follower lists on Twitter. For example, if you follow CNN and the New York Times on Twitter, and most people who follow CNN and the New York Times also tend to follow TIME, we’ll suggest TIME as a “Tweep you might like.” The list of “Tweeps with similar followers” is simply a list of accounts with similar follower lists to yours. 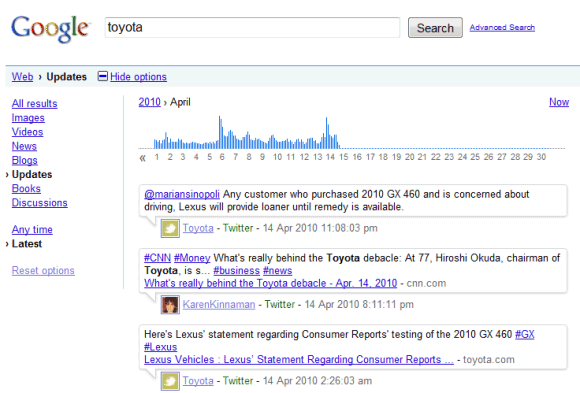 Google’s real-time search results have been enhanced with a timeline restricted to Twitter messages. “The first page will show you the familiar latest and greatest short-form updates from a comprehensive set of sources, but now there’s a new chart at the top. The chart shows the relative volume of activity on Twitter about the topic,” explains Google. For now, Google’s timelines show Twitter messages posted since February 11, but Google promises that they will be extended to the entire Twitter archive. After all, Google paid Twitter to have access to the data. In other Twitter-related news, Google Labs launched Follow Finder, a new service that recommends a list of Twitter users to follow. Google analyzed Twitter’s social graph and it’s able to recommend other Twitter users that are followed by people who follow the users you do. Twitter has just launched a new site called Twitter Media, where it’s offering media organizations and journalists some case studies and guidelines to better connect with their Twitter fans. Alongside the new portal, Twitter has also launched an official Twitter Media account. The site has the description, “Knowledge and tools to help you use Twitter to transform media, entertainment, and journalism.” at the top, then gets right down to business with a series of blog posts. The first details how the Oxygen network used Twitter and other networks to hold a “social viewing party” as an episode was broadcast, which helped boost ratings 92%. (As a control the network only did this on the East Coast; the West Coast, which didn’t hold a “viewing party”, only saw a 14% increase in ratings over the previous season of the show). The site allows users to browse by media platform (tv or web); type (case studies or howto); and topics, which include API, design, legal issues, and news. Twitter has created a similar guide to using the platform before, when it launched its Business portal. That site includes things like a ‘Twitter 101′ guide, case studies, and a glossary of common Twitter terms. Back in December, Twitter noted a new feature it was testing out, Contributors. Basically, this allows multiple people to tweet from one account (with individual attribution below the tweet). Twitter noted that the feature wasn’t quite ready for prime time yet, but they started using it on their @twitter account. Today, the service has started rolling out to others. The Salesforce account had the feature turned on about an hour ago. As you can see, they’re already using it. Contributors is thought to be a part of Twitter’s plan to give premium features to businesses. Though they’re apparently not charging yet for it, one could envision when their business tools are ready to go, this would be wrapped into it. Finally Twitter Launched the new Location feature in USA last night. Twitter’s Tweet With Your Location feature allows you to selectively add location information to your Tweets. This feature is off by default and you will need to opt-in to use it. You can find out how to start using this feature on the How to Tweet With Your Location help page; this article is an overview of the feature. Once you’ve opted-in, you will be able to add your location information to individual Tweets as you compose them on Twitter.com and with other applications or mobile devices that support this feature. The location information that is shared publicly can be either your exact location (your coordinates) or your place (like a neighborhood or town). Even once you turn Tweet with Your Location on, you have additional control over which Tweets (and what type of location information) is shared. The FAQ below has more information about how locations are displayed with your Tweets. We want you to have control over how and when your location information is shared. Tweet With Location is off by default, and as a user you need to opt-in to the service. You can turn Tweet With Location on or off at any time, as well as clear your location before you Tweet. You can also delete all your past location data with a single click (the How to Tweet With Your Location help page has instructions to do this). It’s already a good idea to be cautious and careful about the amount of information you share online. There may be some updates where you want to share your location (“The parade is starting now.” or “A truck just spilled delicious candy all over the roadway!”), and some updates where you want to keep your location private. Just like you might not want to tweet your home address, please be cautious in tweeting coordinates you don’t want others to see. Remember that when you’re opted in to Tweet With Your Location, you can still select to not share your location for individual Tweets, or choose to share a more general location level if your application allows. Please familiarize yourself with our general location settings and the settings of any applications and devices you tweet with so that you are always aware of the information you share. Remember, once you post something online, it’s out there for others to see. All geolocation information begins as an exact location (latitude and longitude), which is sent from your browser or device. Twitter won’t show any location information unless you’ve opted-in to the feature, and have allowed your device or browser to transmit your coordinates to us. Based on that information, Tweets can be annotated with just that exact location, with a place (a town or neighborhood), or with both types of information. For each Tweet, we will publicly display whatever location information you’ve elected to share. For example, if you update from Twitter Mobile and have specified that a particular Tweet should show your exact location, these coordinates can be seen on Twitter.com, Twitter mobile, and in third-party applications. If you choose to only share your place, those Tweets will only be displayed with the general neighborhood information. Application developers are required to be up-front and obvious about whether your exact coordinates will be displayed, or just the place. When you tweet from a third-party application or mobile device, it should be clear which type of data will be publicly displayed. Why do I see a pin-pointed exact location for some Tweets but only the general vicinity (neighborhood or city) for others? What location information does Twitter store? Similarly to how we store the time stamp that says when the Tweet was made, Twitter stores the location information that is publicly displayed with a Tweet for as long as the Tweet exists (or until you click the “clear my location history” button on the Settings page as described here). If you chose to tweet with a place, but not to share your exact coordinates, Twitter still needs to use your coordinates to determine your Place. In order to improve the accuracy of our geolocation systems (for example, the way we define neighborhoods and places), Twitter will temporarily store those coordinates for 6 months. Which browsers support tweeting with location? Firefox 3.5 and Google Chrome on Windows support tweeting with location. To use this feature on Twitter.com with other browsers (older versions of Firefox and Internet Explorer), you’ll need to download Google Gears. If you are not sure what tweeting with your location is, please visit our About Tweet With Your Location help page for more information. Please note that this feature is currently only available for US users – Twitter’s @support account will let you know when it’s available in other countries. How do I tweet with my location? Because tweeting with your location is disabled by default for everyone, you must first make sure you have enabled tweeting with location from your Account Settings. Once you’ve enabled it, applications will be able to tag a tweet with your exact location. You can always disable it and remove all location history from the Settings page, as discussed below. To tweet with your location on a per-tweet basis after you’ve enabled Tweet Location, click the crosshair icon that appears below your update box on the lower left. Your location will then show below the update box. If you no longer want to tweet with your location on your Tweets, simply click the “x” next to your location. This turns off Tweet WIth Your Location on a per-Tweet basis, meaning your location will not be shown until you re-enable it by clicking the crosshair icon. If you wish to disable Tweet With Your Location entirely, please read the following. If you have already enabled Tweet With Your Location, you can disable it the same way you enabled it – from your Account Settings. Making this change only alters your settings going forward. To remove your location data from all your prior Tweets, you’ll need to follow the steps below. Delete the tweet with the data. Remove all location data from all of your tweets by clicking the “delete all location data” button on your settings page. This can take up to 30 minutes, but it will scrub all location information from prior tweets. It is important to note, however, that this does not guarantee the information will be removed from all 3rd-party application’s copies of the data or external search results. Twitter has just announced that it is launching a new anti-phishing feature that allows Twitter’s Trust and Safety team to monitor all links submitted through the service for potentially malicious attacks. Part of the new feature will involve the use of Twitter’s link shortener twt.tl, which may now start popping up in some of your emails and direct messages.